What were you thinking? Did you actually think you could rush to market your Basecamp application and hope you would stand a chance to compete against Topofusion? I think you still have Dorothy's red slippers on and you are still chanting: "We will beat Topofusion; we will beat Topofusion!" Ahhh, when? 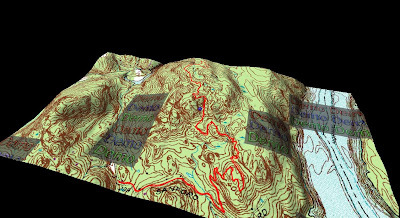 The only thing you have going for you is that the 24K Topo maps are wonderfully detailed! 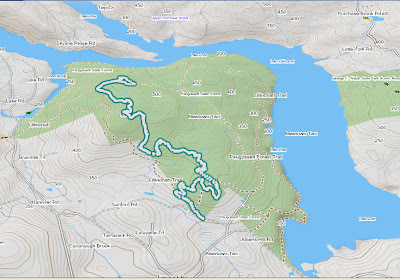 Just look at the existing trails at Upper Paugussett, with the exception of the Gussy Trail, they are all there! The 3D effect isn't that great, the max height it will allow is 200% which is what you see in the shot above. Topo Fusion can go what appears to be 500%. Other things that are lacking are better editing tools and file control. I am really surprised that they do such great maps but have such crappy software to accompany it. How can I access these? Any Garmin Connect integration? Haha, thanks for the great post and kind words. Adam, Garmin Connect is probably their bread and butter and I don't think they could sell this this software if there wasn't a stand alone version (without the internet). ECHO: What software do you use for GPS now? Topofusion does the 3D mapping and I think I am going to move to the licensed version and only post 3D maps from now on. Hmm.. Topofusion was cool mid-last-decade. I think it's way behind the times now. Take a look at Google Earth and what you can do with map overlays, virtual earth, etc. Farley, the limitation with Google Earth is your stuck with satellite imagery during summer so unless all you are interested in is roads, it's worthless.